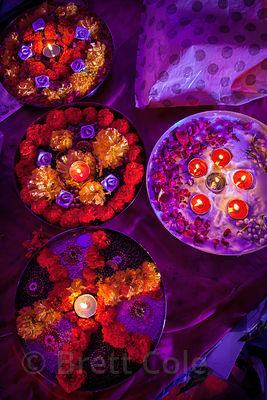 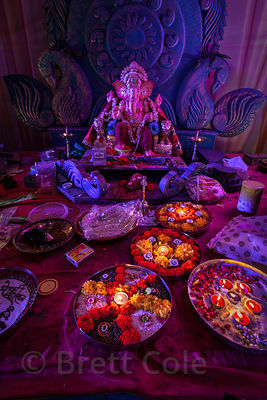 Beautiful Ganesh pandal decorated with candles and flowers during the Ganesh Chaturthi festival in Shekwalhi, Mumbai, India. 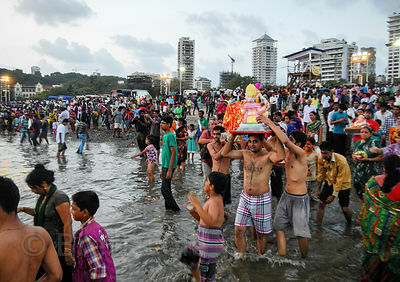 Large Ganpati (Ganesh idols) are immersed into the Arabian Sea at Chowpatty Beach, during the Ganesh Chaturthi festival, Mumbai, India. 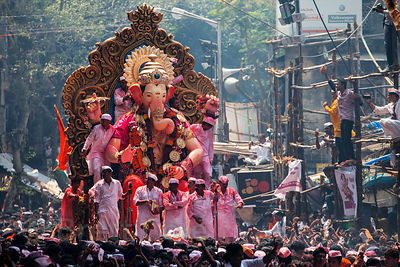 A family parades their Ganesh Idols and dances in the streets in the Lalbaug neighborhood of Mumbai, India, during the Ganesh Chaturthi festival. 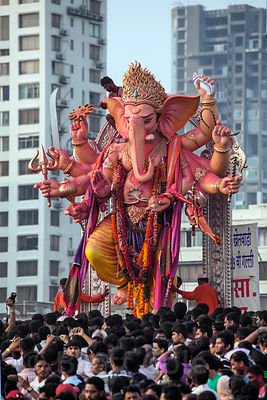 Thousands of people gather at Chowpatty Beach in Mumbai, India to immerse statues of Ganesh in the Arabian Sea during the Ganesh Chaturthi festival. 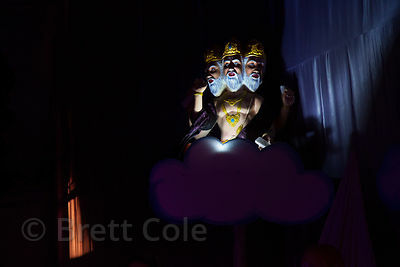 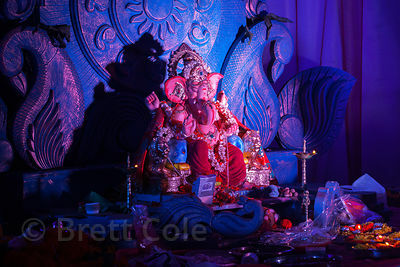 Photos taken during the 1 1/2 day immersion, which is the first of several dates for families to bring their idols for immersion. 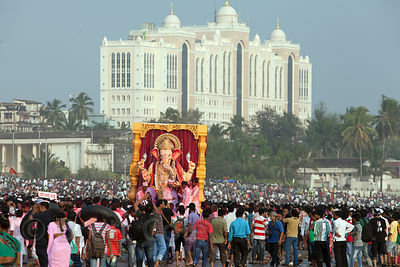 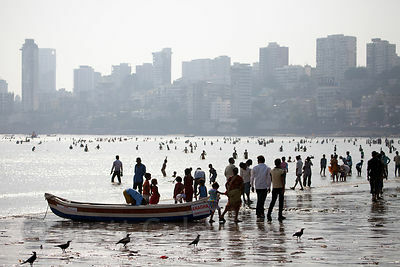 A crowd gathers on Chowpatty Beach to immerse idols of Ganesh in the Arabian Sea during the Ganesh Chaturthi festival. 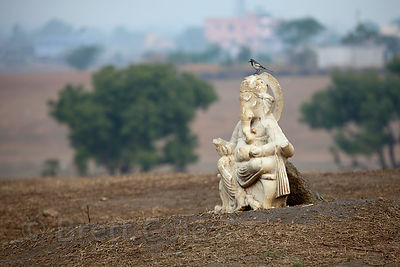 In the background is Saifee hospital. 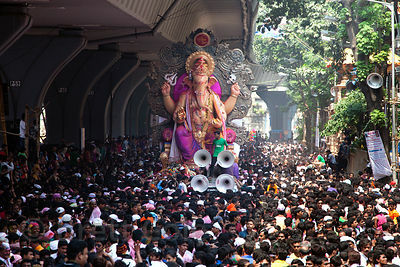 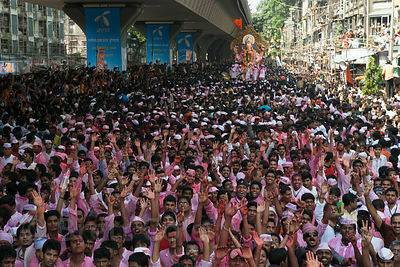 A massive crowd gathers for the culmination of the Ganesh Chaturthi festival in Lalbaug, Mumbai, India. 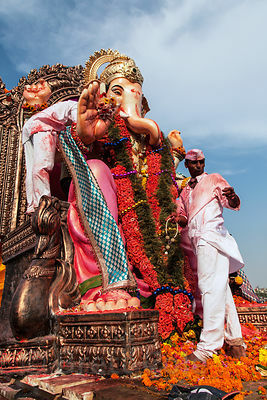 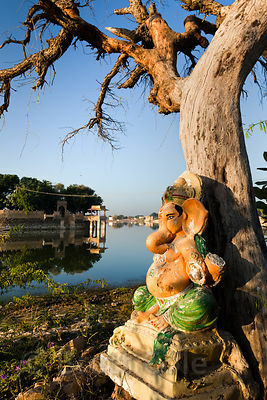 Although Ganesh Chaturthi is observed around the world, Lalbaug is the epicenter of the festival, when several large Ganesh Idols are marched from pandals in the city out to Chowpatty Beach to be immersed in the Arabian Sea. 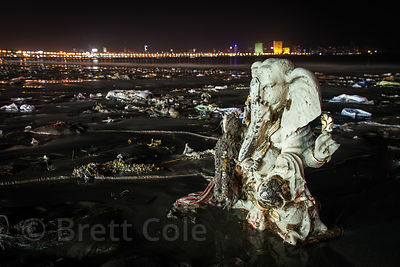 Families immerse statues of Ganesh into the Arabian Sea at night during the Ganesh Chaturthi festival, near Chowpatty Beach, Mumbai, India. 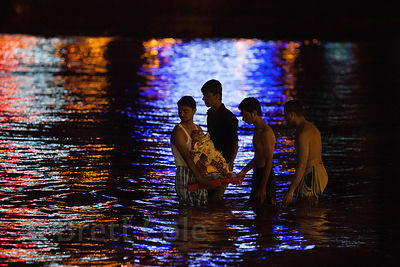 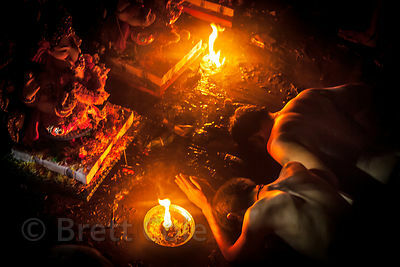 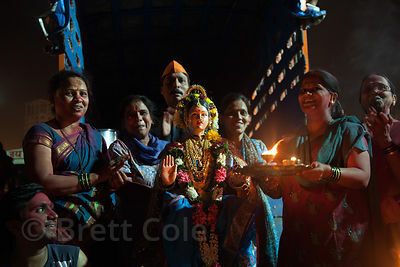 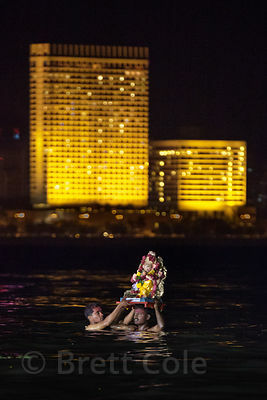 Families immerse idols of Ganesh into the Arabian Sea at night during the Ganesh Chaturthi festival in Mumbai, India. 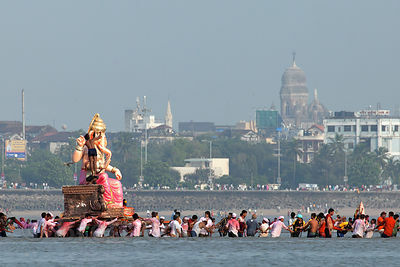 Families immerse statues of Ganesh into the Arabian Sea at Chowpatty Beach during the Ganesh Chaturthi Festival, Mumbai, India. 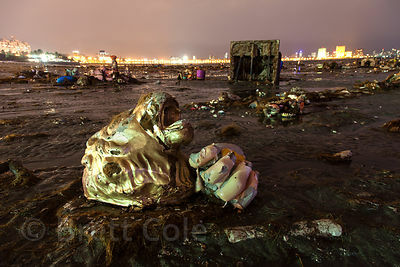 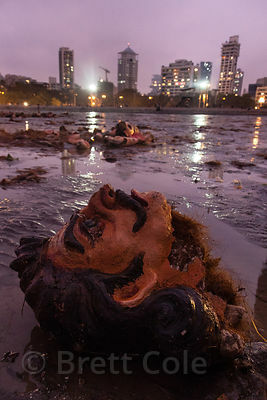 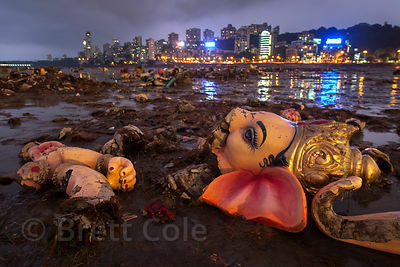 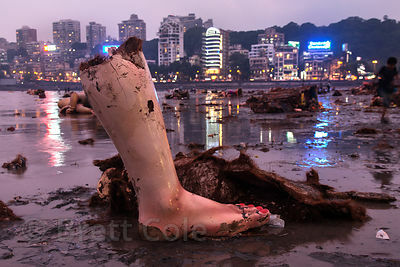 Body parts from idols wash up on Chowpatty Beach in Mumbai, India after the Ganesh Chaturthi festival. 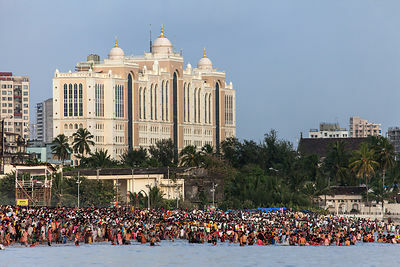 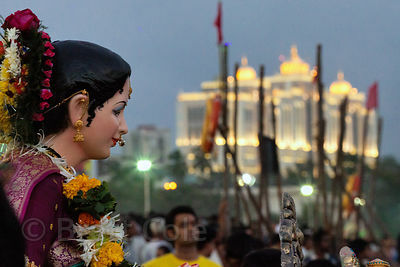 Hundreds of idols are immersed in the Arabian Sea at Chowpatty Beach. 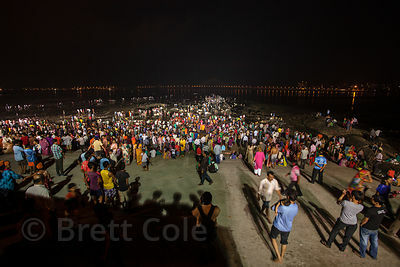 A crowd gathers on Chowpatty Beach to immerse idols of Ganesh in the Arabian Sea during the Ganesh Chaturthi festival, Mumbai, India. 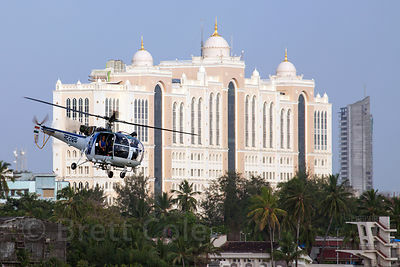 In the background is Saifee hospital. 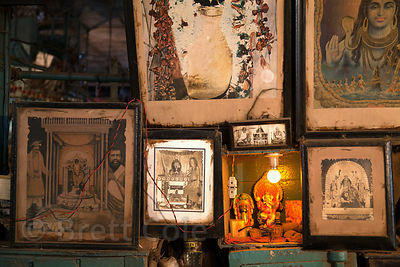 Ganesh idol and religious paintings at a market stall in Newmarket, Kolkata, India. 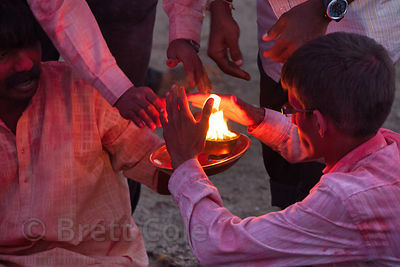 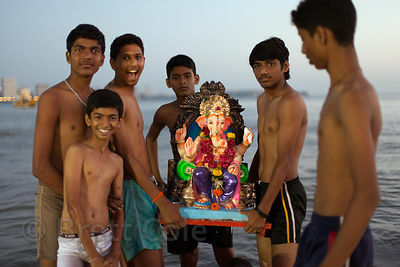 A family from Mumbai, India performs puja (prayer) to Ganesh on Chowpatty Beach, during the Ganesh Chaturthi festival. 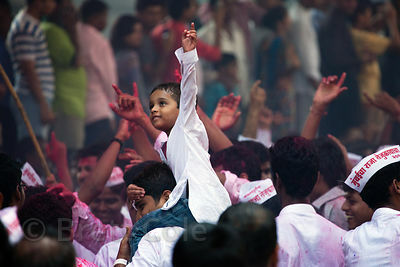 A boy cheers in a crowd at the Ganesh Chaturthi festival in Lalbaug, Mumbai, India. 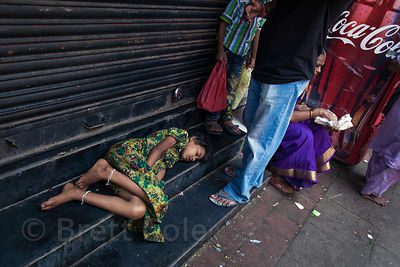 A girl sleeps on a bench in Lalbaug, Mumbai, India. 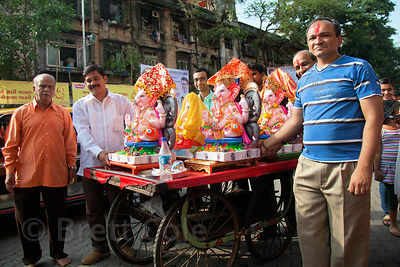 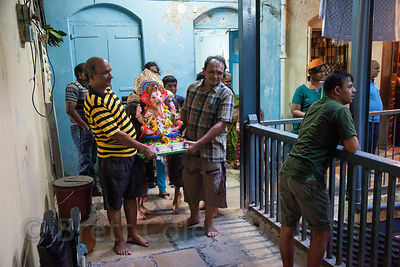 A family carries their Ganpati (Ganesh idol) from their home to a truck, in preparation to immerse it in the Arabian Sea at Chowpatty Beach, Mumbai, India. 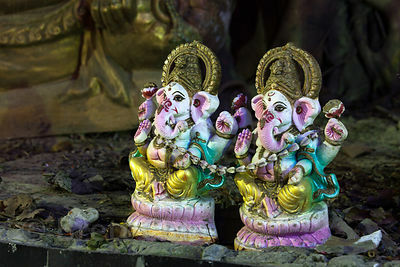 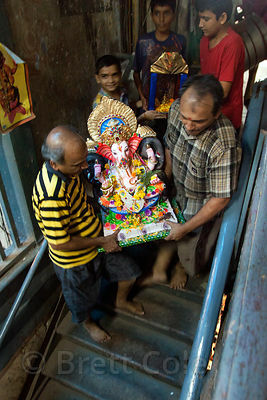 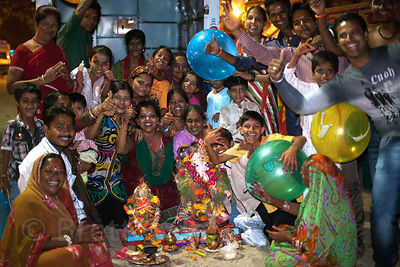 Ganesh idols in a home during the Ganesh Chaturthi festival in Lalbaug, Mumbai, India. 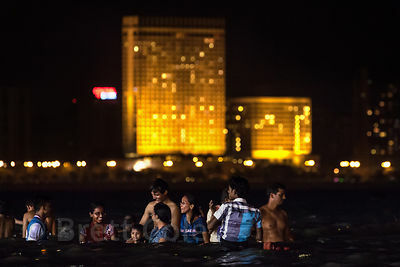 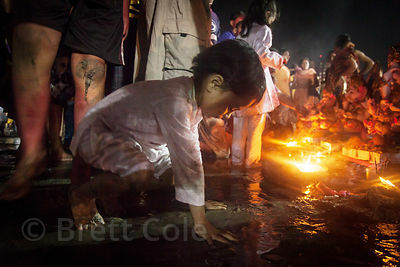 Families immerse idols of Ganesh into the Arabian Sea at Chowpatty Beach at night during the Ganesh Chaturthi festival in Mumbai, India. 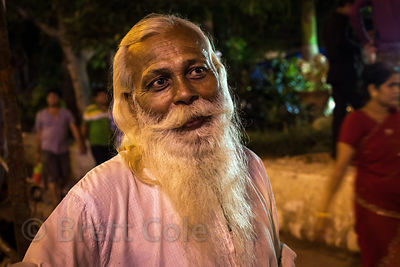 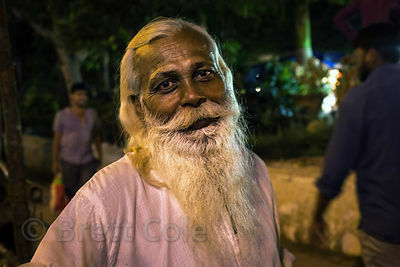 Portrait of an elderly man with a white beard on Chowpatty Beach, Mumbai, India. 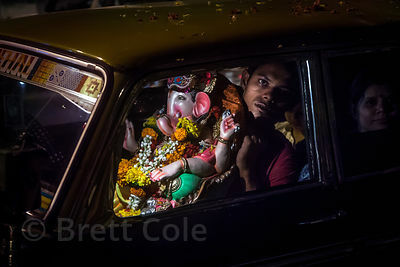 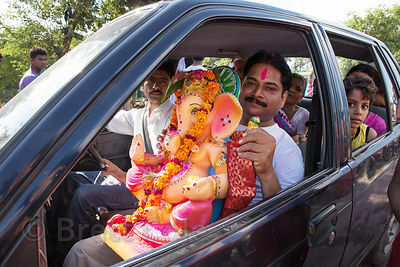 A man arrives at Chowpatty Beach by taxi with his Ganesh idol to immerse it in the Arabian Sea, during the Ganesh Chaturthi festival, Mumbai, India. 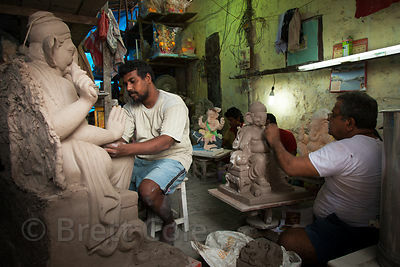 Durga Puja idols being made in Kumartoli (Potter's Town), Kolkata, India. 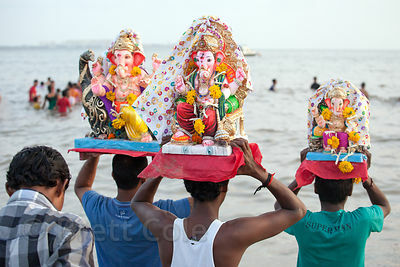 Ganesh idols on Chowpatty Beach in Mumbai, India, during the Ganesh Chaturthi festival. 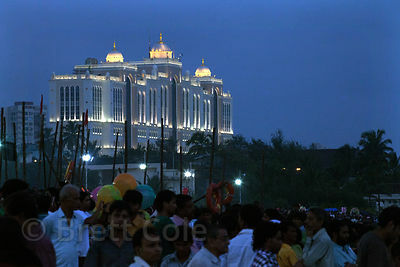 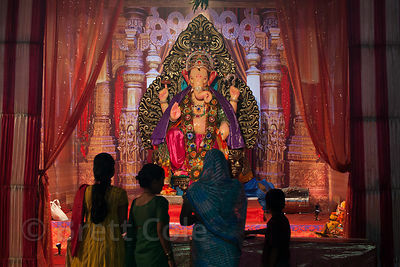 Saifee Hospital in Mumbai, India is illuminated after dusk while families immerse idols of Ganesh during the Ganesh Chaturthi festival. 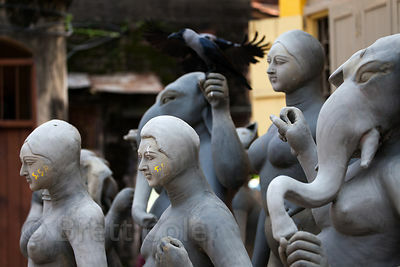 Stunning high-end sculpted figures at a workshop in Lalbaug, Mumbai, India. 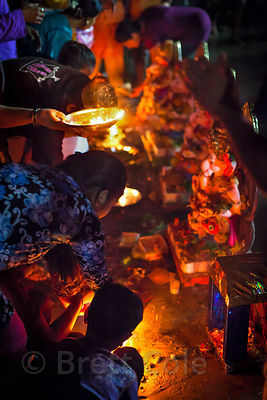 A family from Lalbaug, Mumbai, India performs puja (prayer) to Ganesh on Chowpatty Beach, during the Ganesh Chaturthi festival. 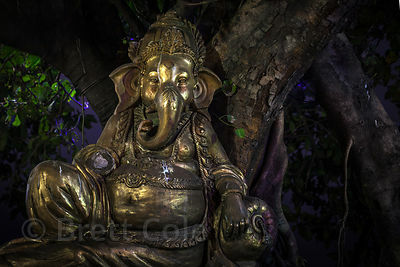 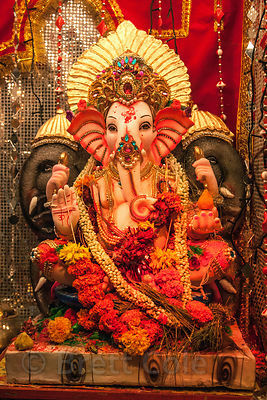 Beautiful Ganesh idol in a pandal in Lalbaug, Mumbai, India. 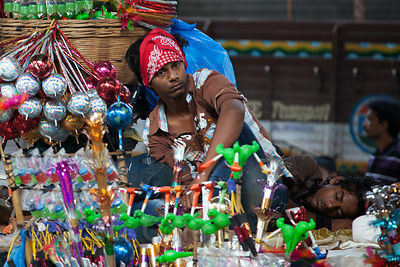 Two men sleep while selling trinkets during the Ganesh Chaturthi festival, Lalbaug, Mumbai, India. 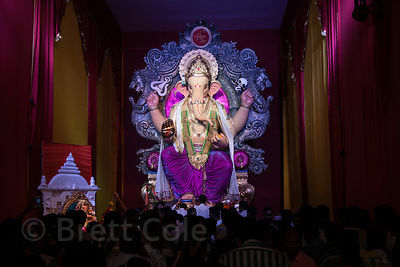 A large Ganesh idol in a pandal in Shekwalhi, Mumbai, India. 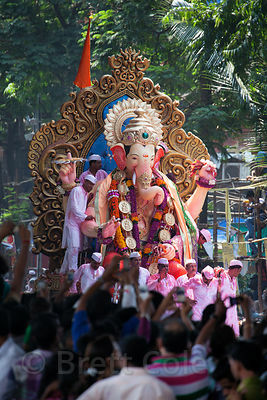 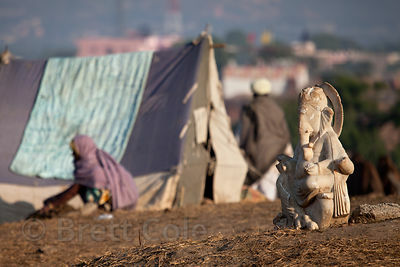 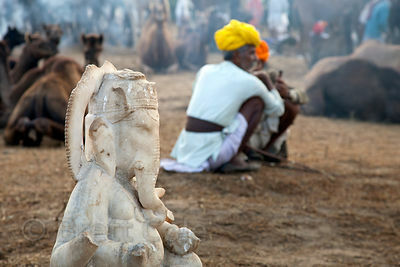 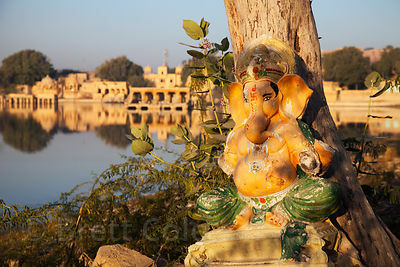 Taken during the Ganesh Chaturthi festival. 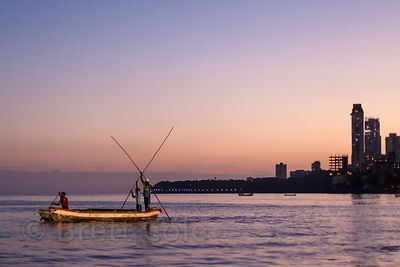 Fishermen in the Arabian Sea in Back Bay, near Chowpatty beach, Mumbai, India. 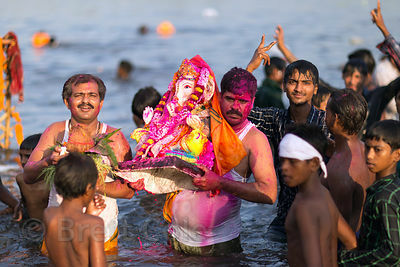 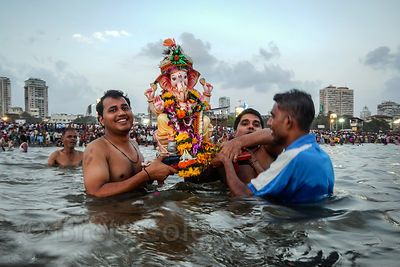 Hindu families in Mumbai arrive at Chowpatty Beach to immerse their idols of Ganesh in the Arabian Sea, on the 1.5 day immersion of the Ganesh Chaturthi festival, Mumbai, India. 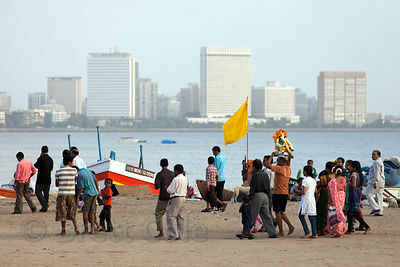 A family brings their Ganpati idol to immerse it at Chowpatty Beach, Mumbai, India. 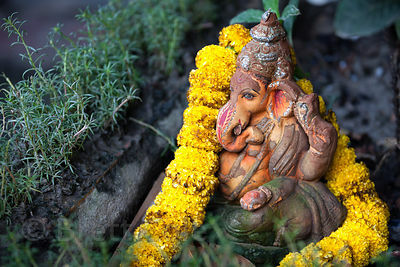 Small Ganesh idol adorned in flowers near Kumartoli Ghat, Kolkata, India. 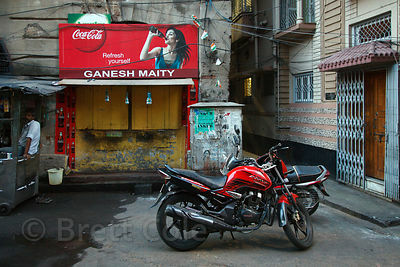 Red motorcycle near the Ganesh corner store, Bowbazar, Kolkata, India. 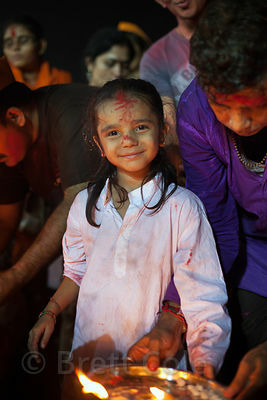 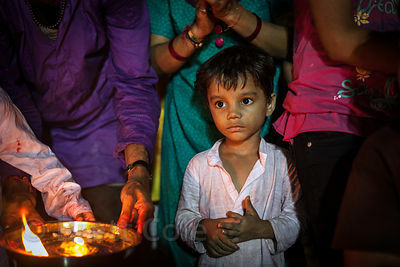 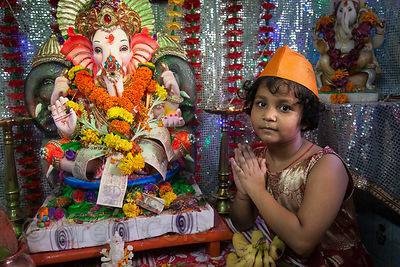 A child prays to a Ganesh idol on Chowpatty Beach in Mumbai, India, during the Ganesh Chaturthi festival. 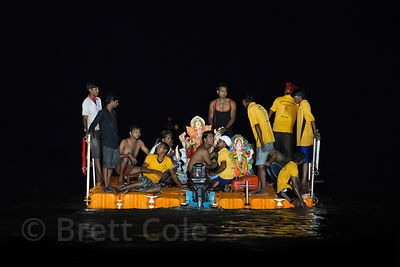 A family immerses their Ganesh Idol in the Arabian Sea during the Ganesh Chaturthi Festival, Mumbai, India. 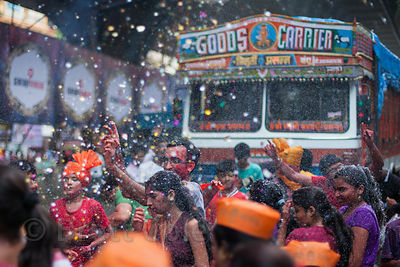 A family dances in the street during the Ganesh Chaturthi festival in the Lalbaug neighborhood of Mumbai, India. 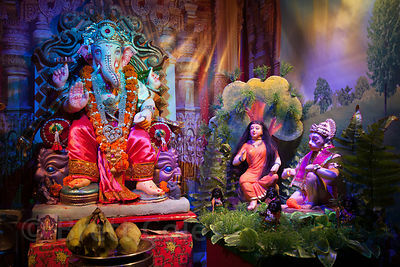 Beautiful miniature Ganesh scene in a home in Lalbaug, Mumbai, India. 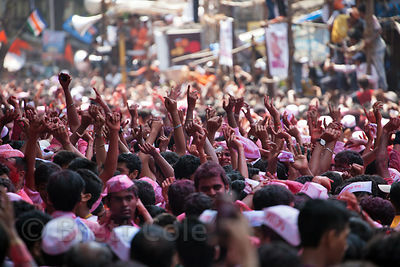 This whole scene is only the size of your hand. 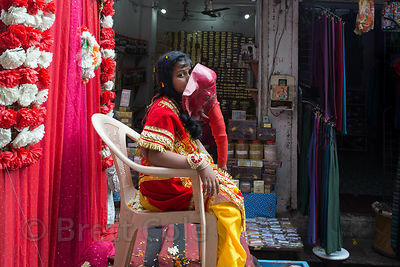 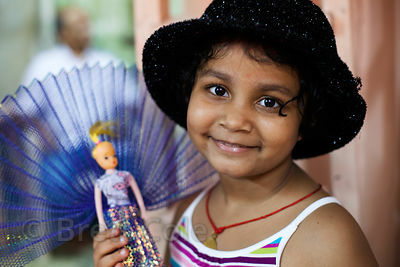 Portrait of a girl and her doll in Lalbaug, Mumbai, India. 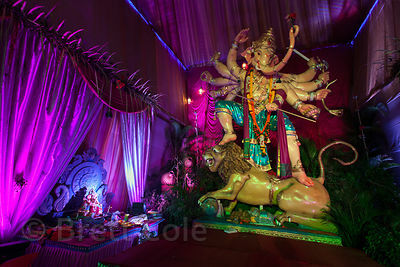 Figure of Brahma in a Ganesh Chaturthi pandal, Shekwalhi, Mumbai, India. 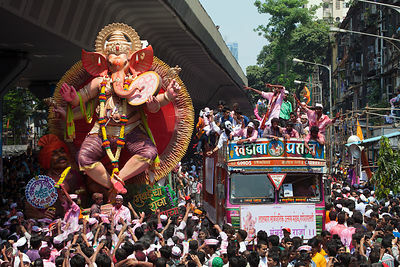 A famous Ganesh idol (2 meters tall) constructed entirely of playing dice, on display in Shekwalhi, Mumbai, India, during the Ganesh Chaturthi festival. 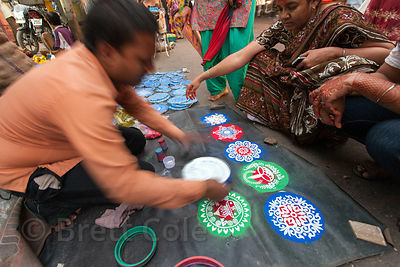 A man sells stencils that let you make designs with colored sand or powder, during the Ganesh Chaturthi festival, Lalbaug, Mumbai, India. 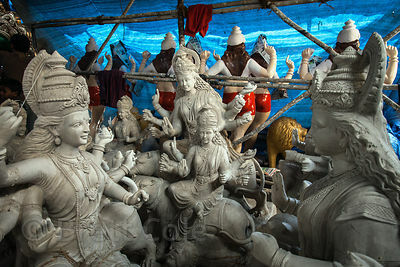 Sculptors in the village of Colaba, Mumbai, India craft idols of Ganesh for the Ganesh Chaturthi festival. 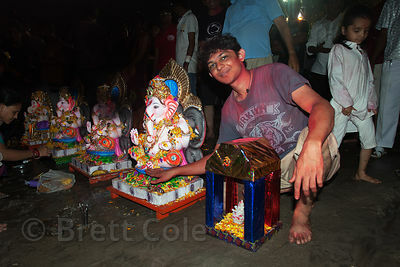 A man sells noise-makers during the Ganesh Chaturthi festival, Lalbaug, Mumbai, India. 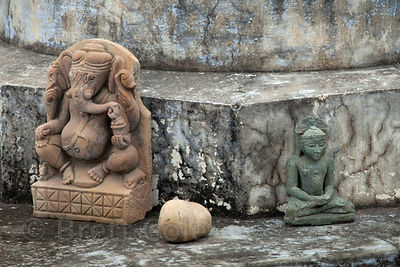 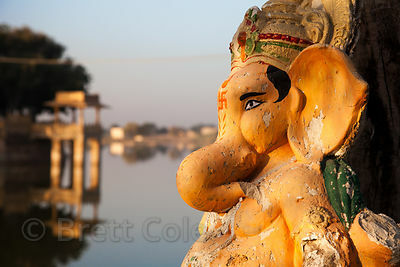 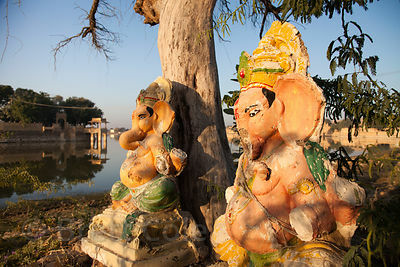 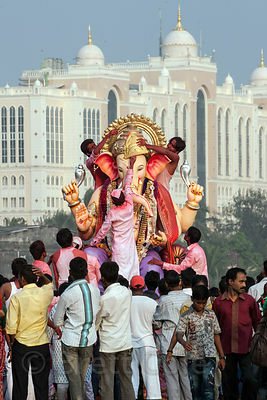 Ganesh idol at Princep Ghat, Kolkata, India. 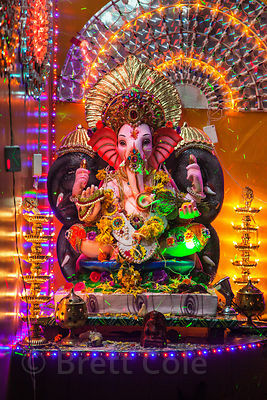 Large Ganpati idol in a pandal in Lalbaug, Mumbai, India. 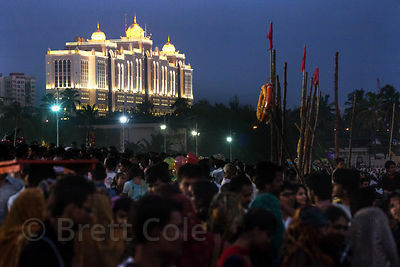 Saifee Hospital in Mumbai, India is illuminated after dusk. 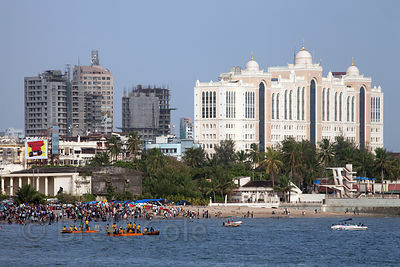 As seen from Chowpatty Beach. 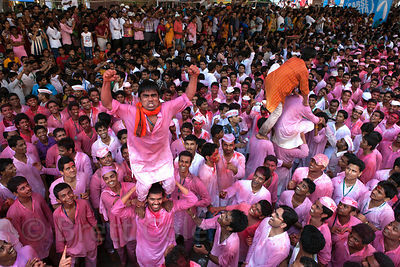 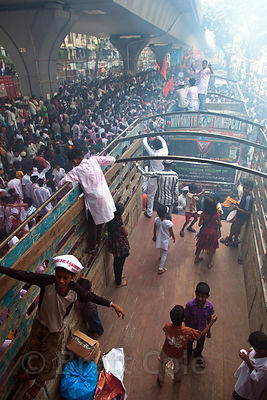 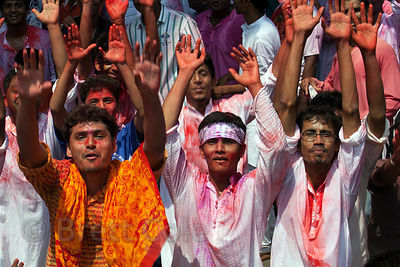 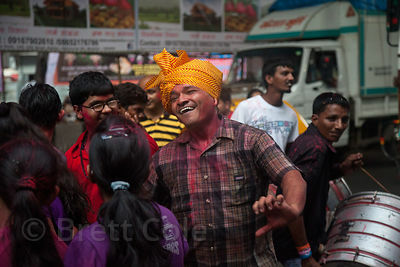 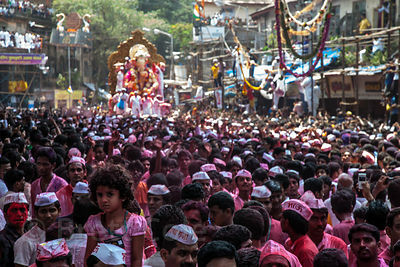 Crowds celebrating the Ganesh Chaturthi festival in Lalbaug, Mumbai, India. 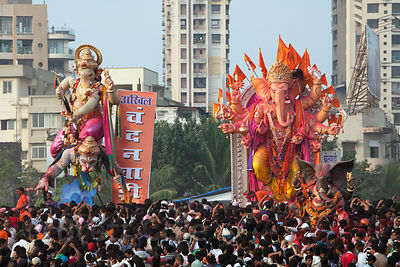 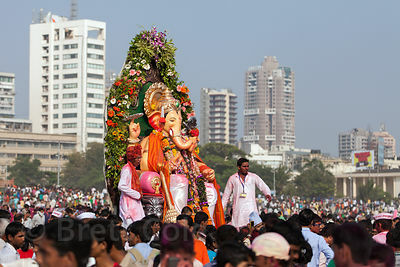 Crowds gather on Chowpatty Beach and Back Bay (Arabian Sea) to celebrate the Ganesh Chaturthi festival in Mumbai, India. 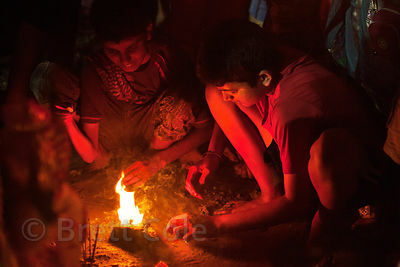 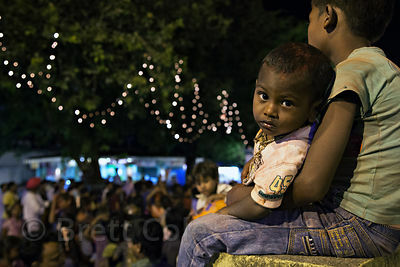 A boy watches a dance party on Chowpatty Beach during the Ganesh Chaturthi festival, Mumbai, India. 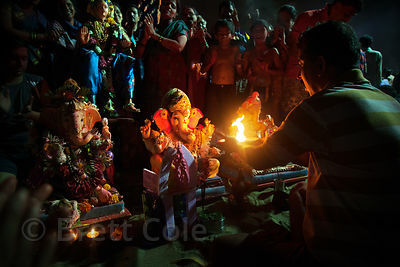 A family prays to a Ganesh idol on Chowpatty Beach in Mumbai, India, during the Ganesh Chaturthi festival. 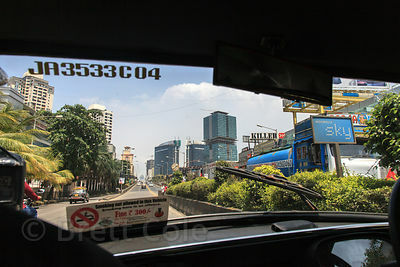 View of Mumbai, India near Mahim, through the windshield of a taxi. 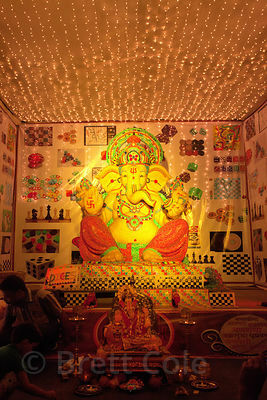 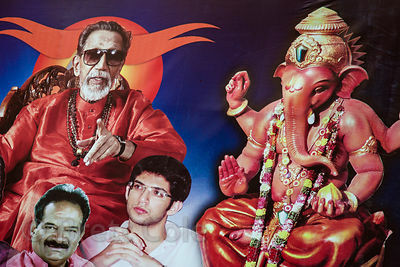 Mural featuring Ganesh in Bandra West, Mumbai, India.